My name is Craig and I would like to thank Anne my keyworker. I don’t know where I would be without her support. I was in the 1st Battalion Scots Guards for eleven years and my career included four tours of Northern Ireland and the Gulf War. I worked on tracked vehicles, support weapons; I was part of Mortar Platoon and trained as a combat medic and in signals. After I got married, I decided to leave the army and became a coach driver, which I thought would be more conducive to a happy family life. Last year my mental health started to deteriorate, and my relationship broke down. Looking back I realise I was in denial; I started living in a tent, but even then didn’t realise it wasn’t ‘normal’ behaviour. I was finally offered a place at a residence providing independent accommodation and support for ex-service personnel who find themselves homeless. Anne was my keyworker and we hit it off straight away. Anne is a great listener and so patient. 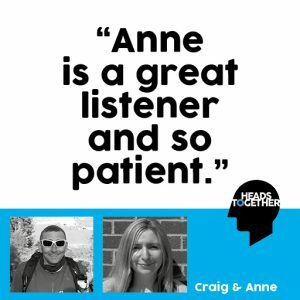 Anne linked me into the mental health team, and I received support for my childhood stutter, which resurfaced when my mental health difficulties escalated. Regardless if Anne was on shift or not, she always attended my meetings, she was always getting me involved in residence activities, making sure I wouldn’t feel isolated. I’ve recently completed a mountain skills adventure training course. I feel happy, relaxed and stress free when working outdoors. I’m now looking at jobs and volunteering that involve working outdoors, like supporting the Cadets or the Duke of Edinburgh Awards Scheme. With Anne’s help, I definitely feel ready to move on with my life. Craig was supported by Walking With The Wounded if you need some support or for further information see their website here.